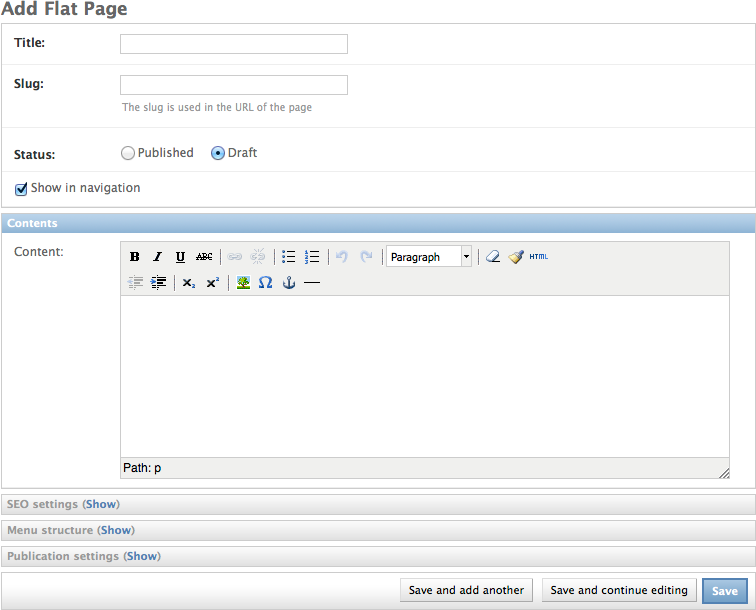 The flatpage provides a simple page type with a WYSIWYG (“What You See is What You Get”) editor. The WYSIWYG editor is provided by django-wysiwyg, making it possible to switch to any WYSIWYG editor of your choice. This page type may seem a bit too simply for your needs. However, in case additional fields are needed, feel free to create a different page type yourself. This page type can serve as canonical example. This installs the django-wysiwyg package. DJANGO_WYSIWYG_FLAVOR = "tinymce"    # or "tinymce_advanced"
To use Redactor, tell django-wysiwyg where to find the static files. This is done on purpose to respect the commercial license. title: the sub title to display in the <title> tag. content: the content to display in the <body> tag. meta-description - the value of the meta-description tag. meta-keywords - the value for the meta-keywords tag. The name of the base template can also be changed using the FLUENT_PAGES_BASE_TEMPLATE setting. The page type itself is rendered using fluent_pages/pagetypes/flatpage/default.html, which extends the fluent_pages/base.html template. ckeditor - The CKEditor, formally known as FCKEditor. redactor - The Redactor editor (requires a license). tinymce - The TinyMCE editor, in simple mode. tinymce_advanced - The TinyMCE editor with many more toolbar buttons. yui_advanced - The YAHOO editor with more toolbar buttons. For more information, see the documentation of django-wysiwyg about extending django-wysiwyg. if True, unwanted HTML tags will be removed server side using html5lib.